Graf Athanaric Thaurismunths sunus fighting on behalf of Grafynja Sigriðr in irska, won Fall Crown Tourney 2017, defeating both Duke Agrippa Morris and Count Ozmund Rus in the final round of three competitors. 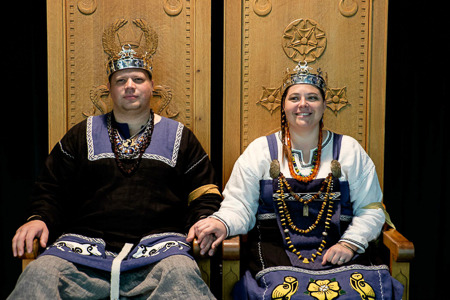 Their Coronation as eightieth King and Queen of Caid occurred on January 6, 2018 in Calafia. Athanaric and Sigriðr abdicated the throne on 1/29/2018, following controversy over the display of a period symbol which has modernly become a symbol of hate speech. Greetings CAID!!! The old year had died and given birth to a new year. Death and renewal are part of the natural cycle of things. Such is the way with natural life, but does it have to be so for culture, and more specifically the Dream? It is no secret that the SCA has changed over its last half century-plus of life, mostly for the better. However, some things have fallen by the way-side. When I close my eyes and dream about yesteryear and the anchors that pull me back to fond memories, I remember the sounds of war: drumming in the distance, folks having a great time, the smells of camp fire in the air, stories passed along, bards wandering from camp to camp singing and playing instruments. In many ways these are my earliest memories of the Dream. What are yours? Now I ask of you another question. Do your actions support or diminish what was and what can be again? Do you complain about how good it used to be while wishing it could be different? I ask you to make it different. Be the force to make the dream as good or even better than it ever was. I was once inspired by the deeds and stories of those who came before, now it is my responsibility to inspire those who will come after. I ask you, the populace of CAID, to be the ones to inspire others so that their Dream can be as good as yours. Confidence and faith in the crown as well as our leadership ability has been broken. We do not believe healing can begin while we still rule Caid. We believe it to be in the best interest of the Kingdom and it’s populace that others succeed where we have failed. We know many in the Kingdom have pledged their love and support to us however we don’t wish for any to continue this fight. We meant no harm but in our poor judgment, harm was done. Harm that can not be healed with words, only deeds. This deed is not imposed upon us, it is made freely and voluntarily. To all Peers, Barons, Baronesses, and members of our court that have sworn fealty and service; Your oath is to the crown, now is the time to keep it. Now is the time to step up and lead during this troubled time. This page was last modified on 13 January 2019, at 07:08.